Over the past 10 years there have been hundreds and possibly thousands of new web design blogs launching online. A small handful of these blogs are still online today, and an even smaller number are still publishing great content. As we move into 2013 it seems like a good idea to dig into the design industry and collect some of the best resources for helpful information. In this gallery I have put together the top 100 online magazines & blogs for web designers, in no particular order. The topics range from web design to Photoshop tutorials, freebies, user experience design, and even web development techniques. I do sincerely hope this gallery may be useful for many years to come these blogs grow in popularity. In my list of all-time favorite blogs 24 Ways has my top vote. Many of their articles focus on obscure web development techniques which are not handled in depth anywhere else. Think of topics such as character encoding, Bootstrap tutorials, complex CSS3 media queries, and lots of other good ideas. Definitely recommend skimming their headlines because you may be surprised at the high-quality content in their articles. The web development agency Tympanus has been publishing online for years under the blog name Codrops. These ideas include not only design trends and UI articles. But many of the tutorials are based around unique CSS3 & jQuery effects. Also their playground section features loads of free plugins and open source code for download. This blog is a very well-rounded choice for passionate web designers. For those interested in frontend development I have to recommend CSS Tricks. They have been running online for a few years and have amassed a large series of very helpful articles. Contrary to other dev blogs, many of their codes are much simpler to implement and easy to copy/paste for your own layouts. If you are looking for another all-around contender for the best design magazine then Speckyboy is an excellent choice. The site curates at least one new article each day and offers a wide variety of content. Design and web graphics are a big part of the content, but Speckyboy also publishes articles related to freelancing and web development techniques. This blog is easily one of the most renowned brands among web designers worldwide. The articles featured on A List Apart have offered incredible benefits related to basic HTML and CSS rules over the years. Their authors have been on top of trends right from the start and their archives date back to 2005 which includes a litany of great ideas. As a follow-up I would argue Smashing Magazine is another renowned brand. Their blog has been online for just as long and employs many freelance writers. Their topics focus on a range of new groundbreaking ideas which shatter the mold of typical web design. Smashing coding, UX, and other mini-blogs have been created to focus in niche design areas. 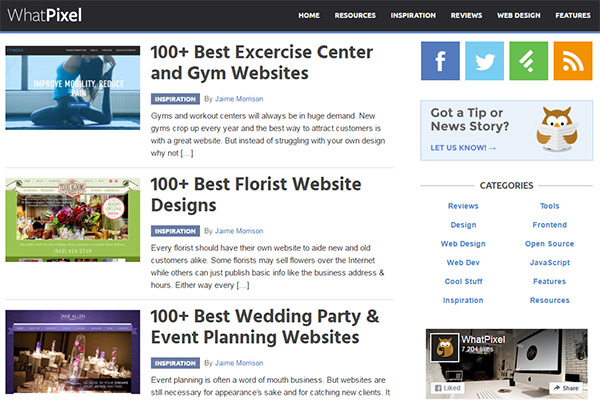 WhatPixel covers all types of websites from small businesses to blogs and startups. The blog publishes lots of guides covering design trends, UI/UX design practices, and the best techniques for creating professional-looking websites. Content is sporadic but every new post is high quality and full of great information for designers and non-designers alike. Cats who Code is a unique WordPress blog focusing on web development trends. Much of the content is directly related to web development techniques, but also holds an interest for WordPress users. They have put together a nice collection of snippets for developers to include at their own choosing. The Noupe design magazine has gone through many iterations of website layouts. Altogether I would say their content is geared more towards graphic designers with a deep niche in web design. Although compared to many of the other blogs Noupe is definitely a classic design-related publisher. I am a big fan of their larger showcase roundups. 1st Web Designer has been online for a few years now and boasts a tremendous amount of content. Many of the showcase galleries rank very high in Google which has drive a lot of new visitors in a short period of time. Users also seem to enjoy the minimalist blog layout which is easy to navigate and switch between pages. WDL has to be in my favorites list by the sheer amount of articles they have kept online. If you search through Google Images you can likely find a series of their old website layouts from archived showcase galleries. I think this is where Web Design Ledger shines the most, which includes web design inspiration along with graphics and general forms of art. The Designshack blog has evolved over the years and grown to include a series of pieces for user interaction. The blog content is tremendous and focuses mostly on frontend web development. However the topics they do cover are very in-depth and provide an excellent resource to learn about newer techniques. Template Monster has been one of the largest online website template retailers for many years. I can remember first visiting their site in the early 2000s and being shocked at how ingrained their links appear into Google. Recently they launched their own web design blog which publishes opinion articles, tutorials, and some cool freebies every so often. Design Bombs has evolved into a magazine dedicated to great ideas and great technology. You will find a lot of showcases on the blog, along with good pieces explaining ideas in the design community. The site also publishes WordPress related tutorials, exclusive deals, and in-depth guides such as how to start a bog, choosing right WordPress hosting, and more. Awwwards is a website gallery devoted to the best layouts found around the Internet. Designers and webmasters can submit links for consideration into the gallery which can drive a small amount of traffic. Their blog also focuses heavily on website aesthetics and trends among other designers. Chris Spooner is a freelance designer from the UK who writes many articles on his own blog SpoonGraphics. These articles include lots of free content, mostly icons and PSD/AI files related to website graphics. But there are also plenty of tutorials on frontend dev techniques. Check out his blog for some nice ideas related to web design inspiration. The weblog Hongkiat is definitely geared towards web designers and also graphics designers. Every so often they will publish complex dev tutorials involving jQuery, PHP, and backend databases. Also plenty of free HTML5/CSS3 code snippets and related tips for building good websites. The blog usually publishes more than one post each day and the content is full of helpful information. The Creative Overflow blog has a really outstanding layout when you first check. The graphics are aligned perfectly and look very nice in comparison to other page elements. The categories feature many general topics like freebies, tutorials, and web design trends. Also their showcases are fantastic and full of great examples. The entire Tuts+ network has been created by Envato and features loads of great content. These tutorials are geared towards the different categories related to subdomain names, and in this case Web Design Tuts+ is directly focused on web tutorials. These are mostly pertaining to frontend or backend development, but there are lots of great design tutorials among the mix. When it comes to publishing on User Experience it is clear that UXBooth takes the cake. Their entire blog is dedicated to building a solid user experience and what it takes for platforms to entice users. These may be website layouts or possibly mobile applications, or even desktop software. Any designer interested in UX techniques should check out this blog. Colorburned is a unique design blog catering towards inspiration and design tutorials. Many of the articles and galleries include detailed examples for the various trends presented. Also a good number of frontend tutorials are published, along with articles on WordPress development. If you are looking for online web development tutorials then look no further. Tutorialzine is an entire blog dedicated to web development resources. Their tutorials are unique and offer terrific insight towards the various web languages. Also each tutorial includes downloadable source code which you are free to edit and copy for your own projects. DesignWoop was launched online just recently and has grown a fairly sizable following. Their content is focused on design resources such as freebies, fonts, icons, and graphics. Also many of the tutorials include frontend tips for building HTML5/CSS3 website interfaces. Crazy Pixels is a web design blog which also caters to users and freelance clients. Much of the content includes showcase galleries and ideas for newer web designers. But you can also find posts for more circumstantial designs, such as Facebook covers and business cards. We can see on Design Your Way a list of design inspiration posts. Many of these are focused on website design, but also include typography and digital graphics. The blog is open for writers and allows a wide variety of showcase content to be published. Vandelay Design is a freelance studio coupled with their own blog. The content includes a wide variety of freebies such as CSS3 interface elements, WordPress themes, and icon sets. There are also many tutorials related to frontend web development techniques. Open source code is available for download on each tutorial in the blog. Many designers have noticed SpyreStudios and enjoy the relatable website content. Many of the posts are showcase galleries along with HTML/CSS/JS tutorials for general website UI. However the galleries include loads of great examples which you probably will not find elsewhere. Spyre is a fantastic design blog and definitely worth checking out if you have never seen it before. Dot Net magazine is actually a real publication which ships orders of physical magazines around the world. But along with their physical subscribers the site also publishes smaller articles in an online blog. Many of the writers also publish in the magazine, but there are additional freelancers on board as well. The topics range from basic web design to frontend/backend programming for web applications. DevGarage is a nice website for designers which also has a small niche in development. The articles often focus on trends in the design world, along with freebies and showcases. The collections relate to resources for designers such as fonts or online code snippets. The Smashing Hub design blog offers a collection of posts which have been online for many years now. The contents range from Photoshop designs and photography to also include web development tutorials and WordPress freebies. Dig through their archives and see if you can find any relatable articles. Vanseo Design has been climbing in the Google search rankings for a couple years now. Their articles are dedicated to design trends which relate to SEO and marketing. Designing a website is not the end of your job since Google and other search engines want to organize this content. Their blog is fantastic to browse through and check out some of the more captivating headlines related to branding and social media. I really enjoy Designrfix not just from their own blog posts, but also including their own social news component. Anybody has the option of submitting design related posts into their news feed and these will show up in the sidebar area. But their blog posts also feature great content which is mostly dedicated towards inspirational showcases. If you are interested in E-mail Newsletter designs then I have to recommend Campaign Monitor’s fantastic design blog. Many of their articles relate to newer announcements in email designs, such as bug fixes or hacks in email clients. Their site has a lot of great content on email design and it may prove to be the greatest resource on this topic. Underworld Magazines is a general design blog with a solid grip on the industry. This includes interviews with many prominent designers and freelancers from around the world. But you can also find great tutorials and digital graphics released as freebies on the site. The blog is constantly publishing new articles so be sure and check back frequently. Naldz Graphics is home to a large number of graphics design inspiration on very obscure topics. These graphics can relate to web design, but also include various forms of digital artwork. There is plenty of great content to find and I would recommend searching through blog entries for some topics you are interested in reading. Illustrators and graphics designers will especially enjoy the roundups for inspiration. Design Instruct was created and launched by Jacob Gube who has written many various articles on the web. This blog is focused on web design techniques and freebies for designers. You can also find giveaway packages and freebies littered among their post archives. DzineBlog is an all-around general design magazine which focuses a great deal into all forms of digital artwork. Many of the posts are showcase galleries or in-depth articles looking at industry trends. But this is the best place to check out for topics like business cards, packaging design, branding, logos, and other various forms of media. Recently the Dzinepress website has been given a dramatic overhaul with a much-needed layout redesign. I enjoy a lot of their content which focuses around lots of web fonts and logo designs. People who are interested in branding will especially enjoy many of their posts. Designs Madness is a blog with a great reach into other areas of web design. Many of their articles focus on new-age media such as Facebook or Joomla! designs. You can also find loads of galleries which include infographics, stock photography, and Internet-based advertisements. Inspired Magazine holds very true to its name and offers a great collection of inspirational design materials. You can browse through their archives and find a ton of web design content. I love their layout which is very simple to traverse in comparison with other design blogs. Also the colors work nicely to not distract from the main content. I do truly enjoy Web Designer Wall since they have such a rich collection of web development techniques. There are some inspirational gallery-type posts in the site, but many of the blog articles focus on frontend design or development tutorials. Although content has slowed in recent years WDW is still very active about posting. This is a cute play on words by spelling Block as Bloq, which also looks like Blog. Their website follows the typical magazine-style layouts you can see in newer WordPress website themes. This allows readers to quickly skim content and find headlines much quicker. Their content includes all-around design resources, but check out their categories for a better idea. Pro Blog Design is another website which has been online for a number of years. Their content has improved over time and the layout has also seen many different iterations. I find these posts are geared more towards bloggers or designers working to build blog layouts. It is a specific niche which does not have many other competitors with this level of good information. Along with the very creative name, Web and Designers is a great blog worth spending at least a few minutes checking out. Their content has been consistent for a while and includes lots of great freebies and open source code. There are also a lot of WordPress posts which include plugins or smaller sample function codes. The design blog 10Steps.SG is a Photoshop-centric website which targets tutorials and free resources. They have been publishing for a long time and many of their posts rank very high in Google searches. If you are new to Photoshop or just want to brush up on some techniques this is a great blog to visit. Designmodo has just recently gone through a design overhaul producing a brand new minimalist layout. I really like their website and also enjoyed their past layout, but obviously the new launch has driven loads of brand new readers. Aside from the free content you may also find premium plugins or themes which you can purchase and download from the site. Another great inspiration blog Design Beep runs a standard website layout which handles a wide variety of content. Many of the posts are showcase galleries with an inundated trend towards website design. However there are other graphics-related posts which include photography and icons as well. Web Design Dev is the self-branded creative online journal for web enthusiasts. They publish a lot of different content all pertaining towards website design & development. You will find loads of great tutorials and freebies for download, along with some opinion pieces every so often. Unmatched Style is a newer design blog which holds a great deal of content and has kept up with publishing for a while. The site is designed around a showcase gallery which hosts many great examples for website layout trends. But the blog/news section is updated frequently with new posts and happenings from around the world. Orphic Pixel is your typical run-of-the-mill design blog which hosts a large amount of different content sources. Website graphics and logo designs are typical and this leads to many dynamic showcase galleries. But their content is very helpful when looking for unique ideas after starting a new design project. Line25 web design blog was launched by Chris Spooner to include a wide variety of helpful resources to designers. There is a great deal of inspirational posts but not without other great content. Their articles and tutorials look into many aspects of design such as web typography and jQuery development. Here we have another great design blog with a solid focus on tutorial content. Many of these blogs do not exist anymore, or just don’t keep up with new content. But Web Design & Such is constantly publishing new tutorials related to HTML5/CSS3/JS and even WordPress posts. Be sure and check out their archives to see if you can use any of their great publications. Build Internet is a large magazine geared towards Internet trends and technology in general. But there is a great deal of design-related posts and opinion pieces about creating websites. Also they feature tutorials for developers and designers which is a nice bonus. Dev content even includes some aspects of iPhone app development which is a rare occurrence on the web. You the Designer is a graphics design blog which publishes loads of new inspiration showcases. Their website has a lot of cool features like a job board for freelancers, along with a freebies section to include lots of free downloadable content. There must be some readers who are familiar with the Design Float social news website. Their website curates some of the latest blog posts from around the web which get voted on by the community. Their website also hosts a small inspiration blog which publishes a lot of innovative galleries on newer graphics design trends. Web Resources Depot is a trendy blog with a very hip naming scheme. Their layout has been recognizable and online for many years, so the fan following has grown by a wide margin over time. Much of their content relates to inspiration resources and free downloads. It is a fantastic website which I would recommend to any graphics/web designer. Code Handling is a free online blog publishing content related to web development tips. The layout is very minimalist but offers a great deal of content. I would recommend skimming their categories to see if there is any interesting post content related to your own work. Bittbox has been online a number of years and continues to add new content every week. I enjoy the layout which has presented clean and clear information at the front of the site. The content is focused on design freebies which mostly include patterns and textures for web layouts. There will always be designers who are interested in moving into the realm of WordPress development. However where can these new users to go study? The WP codex is a nice place to start, but for tutorials I would have to recommend WPKube. Their blog has all the WordPress content you will ever need and boasts a considerable fanbase. Paulund is the design blog of freelancer Paul Underwood who writes on tutorials and exciting new web design trends. Paul is fantastic with WordPress development and often publishes his code snippets online for free. The blog is also simple to navigate and performs well in all browsers. InstantShift offers a myriad of post content which expands well outside the realm of web design. Many of the topics are focused on the web – and especially WordPress tutorials or code snippets. But you will also find examples of design inspiration related to photography, web fonts, and icon design. Speaking of minimalist web design, Pixel Clouds has to be the cleanest and most basic and simple blog I have ever seen. The article headlines are listed one at a time and do not provide any type of preview on the content. I find most of their posts related to niche styles of web design, which may or may not prove useful in the long term. David Walsh has been writing articles online for a very long time. I have seen numerous examples which turn up in Google searches for tidbits of helpful CSS/JS codes. He mostly writes on browser bugs, fixes, hacks, and small code snippets to achieve minor UI updates. His website is definitely worth a peek if you are interested in frontend web development. The Pelfusion design magazine has been online for a few years and publishes very high quality content. Many of their articles relate to design inspiration and showcases, but you can also find great tutorials in the mix. Another good part of their showcase collection is that many of the topics are unique and not often found in other design blogs. Queness also offers great web design inspiration on topics which are more obscure than the general consensus. All of their ideas are beneficial to designers such as breadcrumbs, dropdown menus, and pagination designs. They also publish lots of freebies and open source code snippets for developers. UX Movement is a newcomer into the field of user experience design. Their blog has a tremendous number of articles which all relate to building a fantastic user experience on the web. The topics include wireframing, forms, buttons, and lots of other specific UX elements. They also host small giveaways and freebies from time-to-time. Another blog using the smashing branding is Smashing Buzz. Their content is geared more towards Internet technology but also has a focus on website design. You can find loads of content about Apple, Microsoft, and Google news publications. Also lots of roundups containing web design/development software packages. Web Design Habits is a blog that I just recently found a couple weeks back, and I have been very impressed ever since. Their content includes a lot of inspiration showcases with alternate posts on design tips, open source codes, and free downloads. Many of the roundups also feature tutorials which have been published – generally all related by the markup/coding language used. There are not many blogs online which discuss design trends related to search engine optimization. However SEOMoz is one of those blogs and possibly the best you will find. Their topics range from keywords to backlinking and creating scalable website designs. Check out the front page and skim their article headlines to get an idea of what it’s all about. I’ll start out by saying this is a great publication which has been online for a long time. Tripwire Magazine is a web design and development blog which publishes a lot of new articles on various subjects. These often include showcase galleries on trends in new web design layouts. Think of topics such as sports, gaming, web hosting, etc. Design Tickle is a Dribbble showcase magazine which publishes design roundups from new Dribbble shots. Much of the content is related to website layouts and user interfaces. But you can also find tons of other graphics design inspiration, and even user interfaces for iOS mobile apps and software production. Pixel77 is a much lesser-known blog amongst web designers in the community. Their posts are focused on graphics inspiration & tutorials for the popular software suites. These include Adobe Photoshop, Illustrator, Flash, and Fireworks. Also plenty of great resources you can download for free including fonts and icon sets. This CSS-themed web design blog focuses on tutorials and great CSS website designs. The name CSS Reflex implies they mostly publishes tutorials on CSS2/CSS3 trends. But actually you can find a host of new ideas related to general web design presence. Their layout is a bit compact, but you shouldn’t have any difficulty navigating between posts. 2Experts Design blog has been online for quite some time. I have not seen their posts getting around as much, but I still feel they publish excellent quality articles. Much of the content is related to graphics design such as icons or wallpapers. But their topics also include more eccentric titles like CD case designs. Demortalz is an inspiration blog catered towards designers and webmasters. It handles a lot of strange content which you do not find elsewhere. There are lots of showcase roundups which include concept artwork or sketches. Also digital artwork not pertaining to websites such as drawings or logo concepts. DesignPin Blog is a fantastic resource which is actually newer to the field of web design. Their content is still gaining a following but it is worth checking out when you have some time. The posts are mostly inspiration galleries which also include web development techniques. jQuery plugins and WordPress codes are hot topics among many other headlines. Favbulous is a cute play on words which is noticeable in many of these design blogs. The site is known for posting many awesome freebies related to PSDs, AIs, fonts, icons, and other sets of web graphics. Designers will also enjoy the articles which hold collections of inspiration and concept artwork. Along with the other graphics design blogs Artatm is branded as more of a creative art magazine. Their posts include the typical resources you would expect to find with other website content. Almost all of their posts are showcase galleries but the ideas are very rare in comparison. These topics include WordPress Dashboard plugins and Photoshop texture brushes. The great design blog Slodive in an inspirational magazine which has been online a few years now. Their content has been growing very quickly and you’d be surprised how often they rank in web design-related Google searches. Many of the showcases include layout designs but you can find tons of other relatable graphics/digital artwork. Also you may find some gems in their tutorial/code archives handy for frontend developers. Top Design Magazine features a beautiful website layout which is super easy to navigate. I definitely enjoy the small breadcrumb feature you notice right underneath the navigation links. Their content is mostly inspirational galleries for different types of graphics and branding effects. Inspirationfeed has been a steady source of useful design articles for many years. I have enjoyed their website and often find showcases ranking for trends in web design. Recently the site got a brand new makeover and it is much easier to play around with. I would recommend checking out some of their categories and seeing if the site can offer support on your next design project. Webexpedition18 is a much newer magazine having been launched originally in 2008. Their posts are fantastic but sometimes lacking a bit on content. The layout design is basic yet simple, and you can easily find the articles you are looking for. Also each post is categorized by tags which are numbered and listed off conveniently in the sidebar. Phire Base is a portfolio website which has expanded to include freebies and a blog section. Here you will find hundreds of articles related to design inspiration and unique roundups. I would suggest this site is worth poking around for a couple minutes, but many of their showcases follow the same ideas as other website design blogs. Red Team Design blog is one of the best resources on publishing frontend tutorials. Much of their content relates to jQuery code, but it is often done from scratch and offers a free download to readers. This is a great place to study techniques for building common interfaces in dynamic website layouts. Pixel Detail has undergone a brand new redesign and also a branding change. However the site has kept its original domain name and continues publishing inspiration galleries every week. A lot of their content includes Internet marketing trends for making money online. I’d argue this is more of a blog for webmasters than designers, but still offers great information. Inspire Monkey has been online since I first started doing web development. Their posts range from showcases, tutorials, opinion pieces, and loads of customizable freebies as well. I specifically enjoy their tutorials for the breadth and depth of each step in the process. Definitely an excellent resource for web developers looking to pick up new ideas. Range is a WordPress development studio which also publishes new trends and tips onto their design blog. It is not updated every day or even necessarily every week. But their content is genuine and worth the glance if you are interested in WordPress development techniques. Their posts also go into areas like responsive design and open source GPL code licensing. WebDesigner Trends is the first and only magazine in this set written in a different language. Their blog publishes in French but offers a large collection of showcase galleries for inspiration. I can’t argue that their tutorials and articles are a lost cause for those who cannot read French. But the layout is simply fantastic, and it is worth at least a glance for ideas on building scalable website layouts. Downgraf offers all the bells and whistles you would expect with a typical design magazine. Tutorials, free codes, free graphics, and lots of inspirational posts related to design aesthetics. Their blog layout is very simple to maneuver and the text is also easy to read. Additionally they publish under a large number of categories which is worth a quick look over. W3M is an overlooked web design blog which I feel honestly publishes some amazing quality posts. Their website just got redesigned during 2012 and it is much nicer to look at now. It also looks more like a magazine rather than a typical WordPress blog, which is nicer for building a solid number of readers. This is another personal favorite which I just discovered a few months back. Ahref Magazine is a newer online magazine which many designers have barely heard about. Their content doesn’t always rank in Google among other competitors. But I simply adore the layout design and many of their headlines are quite captivating. The site also does plenty of giveaway contests and posts new freebies in relation to web design resources. It is worth checking out to see if you may want to subscribe and become a regular reader of the publication. jQuery4u is a blog for jQuery developers to get in touch with the latest news, tutorials, plugins, videos, basically anything. The layout is simple and looks exactly as you would imagine a magazine-style website to look. Also their post content is one-of-a-kind and very unique from other web development blogs. UXDE publishes a lot of design resources for inspiration galleries. These often include website layouts and WordPress themes, but also resources for designers. You will not find any solid tutorials but UXDE is a great magazine for designers looking to get some inspiration or free web resources for download. There haven’t been a whole lot of dev blogs in the list but I personally adore this one. Expert Developer is a 100% web development magazine which caters towards frontend developers. Their articles boast a considerable amount of traffic and provide solutions for many common problems in website layouts. Topics venture into backend programming as well, which includes setting up dev environments for PHP/Rails/Python/etc. This blog is definitely worth a visit and check out their post archives if you get the chance. Boost Inspiration is my final website design blog in the listing. The posts contain a lot of roundups and showcase designs. These are meant to provide inspiration to designers who need a template for building web UI elements. But aside from websites they also cater to 3D artists, photographers, sculptors, illustrators, and many other forms of art. Web Design Tuts+, Smashing Magazine and Designmodo. Thanks for sharing!! !